This is my newest phone....just came in the mail this morning. I found this phone on eBay, and was able to identify it as being a dates matching set from 11-57 (With the help of Dennis Markham's blog posts "Is it really from 1957?"). It's pink (and from what I understand 1957 was the first year for pink!). This phone also marks a few firsts for me. It is my first "hardwire" phone and also the first phone I have gotten which needed to be re-wired to ring (easily done with the help of this site!). It is my second soft plastic set, my first one being a dates-matching black 500 from 4-57 (which was the 4th phone I bought, back before I even knew what soft plastic was). It works great (but is anyone really shocked by that?). it has a few imperfections, the dial is missing the center piece, and there are a few gouges in the back of the handset (looks like a dog got a hold of it!) but all in all a pretty impressive set!! You have an excellent pink soft plastic 500 there. Yes, 1957 was the first year for a pink 500. They did have Old Rose 302s before that. The coil cord still has a lot of pink in it. Be careful not to expose the cords to a lot of sunlight. They fade to white fairly easily. I think the dyes were unstable. I like how you were able to find the info you needed from the Forum posts. It makes our efforts worthwhile when someone else can find what they need here. And it sure saves time not having to repeat ourselves! You can print out a number card with your favorite exchange name from the number card archive (link below). To replace the acetate disk, you can cut a circle out of a clear plastic take-out box or something similar to protect the card. Finding the metal retainer to hold it in may not be easy. You can use cardboard until you find that piece. At least you got a nice fingerwheel--those are often broken. The coil cord still has a lot of pink in it. Be careful not to expose the cords to a lot of sunlight. They fade to white fairly easily. I think the dyes were unstable. The cord is faded a bit, mostly on the outside of the coil. the 'inside' of the cord is more pink. It really isn't that noticeable. One question I have to ask about the phone.....I have handled it quite a bit today, and of course being a soft plastic set it has that characteristic 'cheesy' odor to it. This phone's odor is very strong, definitely stronger than the odor from my soft plastic black 500. I have washed my hands 3 or 4 times today just to get the odor off of them. you can even smell it a couple of feet away!! would it have been this bad 54 years ago, or have these phones gotten more 'aromatic' over time? I can't imagine people putting up with this day in and day out 50+ years ago!! One thing about those soft plastic sets: DO NOT put the housing etc. in a dishwasher to try to wash away any mold or whatever's causing the smell or otherwise sanitize it. The hot water in the dishwasher WILL cause that plastic to warp permanently and thereby destroy it. Speaking from unfortunate experience a few years ago. Best way I've found to clean phone plastics is with lukewarm water and soap or dishwashing liquid, and a dedicated soft or medium toothbrush. I don't think bad smells came with the product when new. 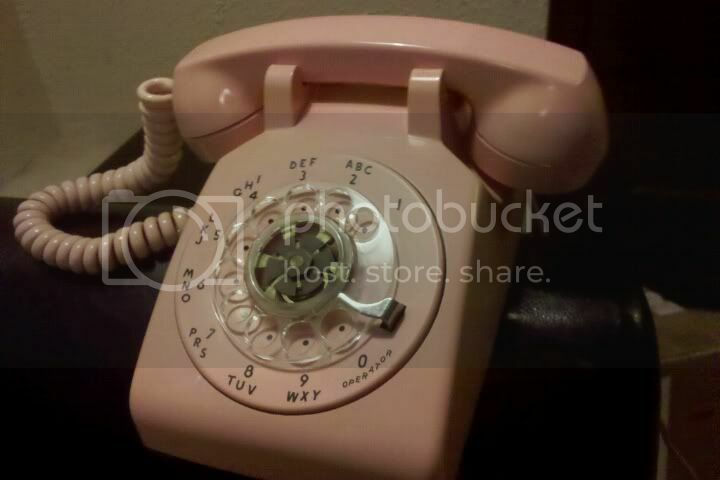 Western Electric wouldn't have made a mistake like that, and the Bell System wouldn't have accepted it if they had. I think it's likely that it's the outcome of an unforeseen interaction of the plastic with some environmental factor such as mold or humidity or something, rather than just a change in the plastic over time, though I may be wrong about this. Oldphoneworks have the dial card mounting hardware for both WE and AE dials. I have two soft plastic 'phones, SC 1543 and North 540, both black. The SC smells slightly, and the North much more strongly. We didn't have any over here, we went straight from Bakelite to ABS. When I first unpacked the North the smell was really strong having been wrapped up for several weeks in the post, I coud smell it from several metres away, but it smells much less now. The smell is rather like vomit. I believe that the plastic is mainly cellulose triacetate, the same thing that photographic film is made of, at least that which isn't polyester. If, as some people have said, the soft plastic was made by Eastman Chemical then I suspect that it may have been made from recycled scrap material from thr film making process. I used to have quite a large collection of documentry film, both 16mm and 35mm, though most of it has been disposed of to warious archives now. I've never seen triacetate film which smelled of vomit; maybe it was a reaction with the pigment, or some other material which was added to it to make 'phones. Triacetate smells of vinegar when it goes off, old nitrate film, which I've also handled quite a lot of, has an unpleasant sort of rotting vegetable smell when it starts to decompose. It's unlikely that telephones would ever have been made of cellulose nitrate, but it was used for things like combs, and even faces for children's dolls, at one time.